Siped General Grabber MT's before the grooving. The off-roader's quest for more seemingly never ends, and more traction is always coveted. I wanted more traction, especially since we tend to see plenty of wet, muddy, snow- and ice-covered trails in this area, but I already had traction devices front and rear and mud-terrain tires. 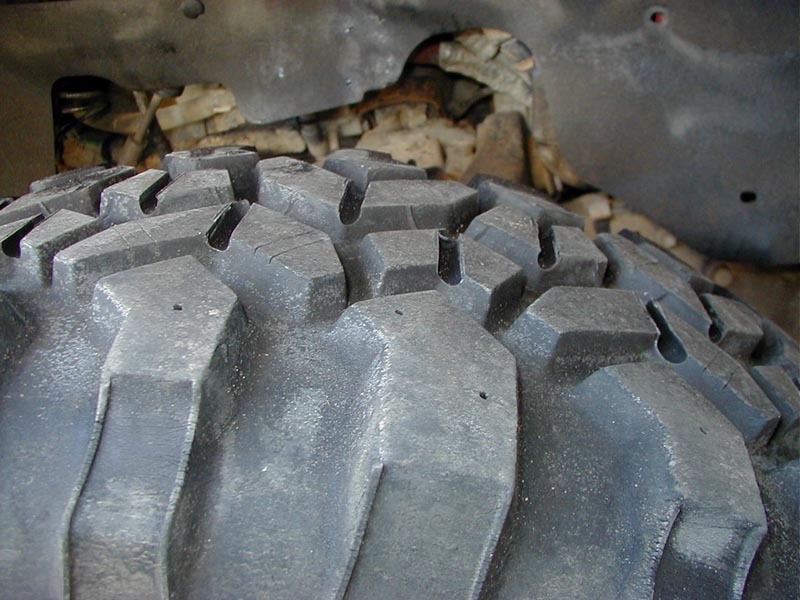 I siped the tires in early 2001, and that provided benefits onroad and offroad. 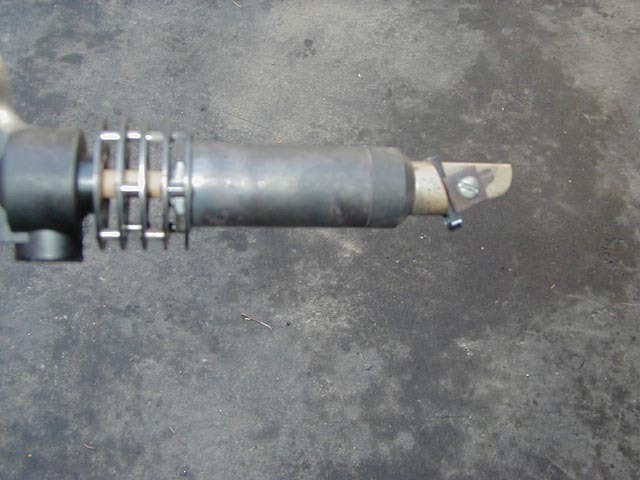 Not wanting to spring for new tires, I realized I could redesign my tread with the Ideal Heated Knife I had previously used to sipe the tires and hopefully see an even greater increase in traction. The Ideal knife makes siping and grooving a breeze. It has a 250 watt heating element with a brass head that once adequately warmed up makes cutting tire rubber almost effortless. Last winter I siped my General Grabber MT's on a freezing day, and this year I grooved them on another 30-degree day and completed all four in less than 90 minutes. The Ideal heated knife works great for siping or grooving. Setting the cutting depth prior to using the knife. Prior to heating up the knife, I set the depth of the blade. 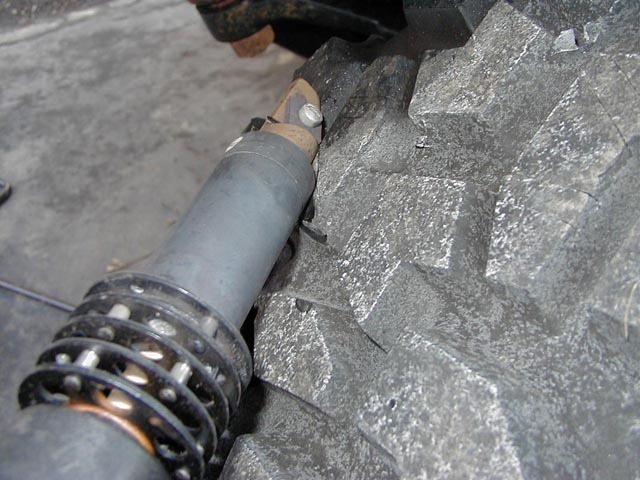 When grooving (or siping, for that matter), you do not want to get too close to the carcass of the tire due to the possibility of damaging it. I set the depth at 1/4", which was enough to provide a deep cut but still at least 1/8" away from the carcass. 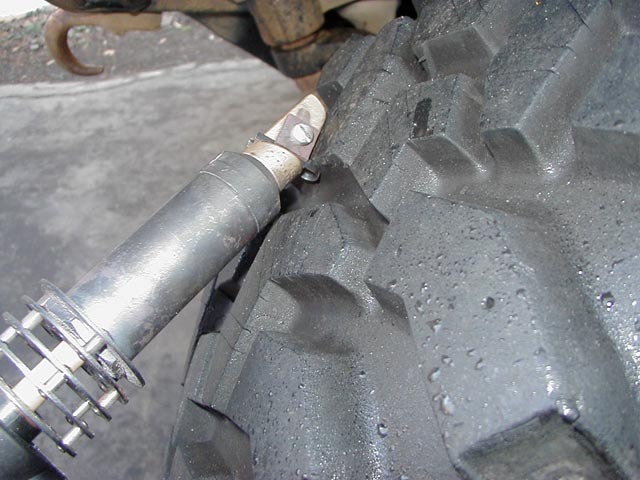 Since the knife makes this job so easy, being conservative on the depth is not an issue because the tires can easily be grooved again as they wear down. 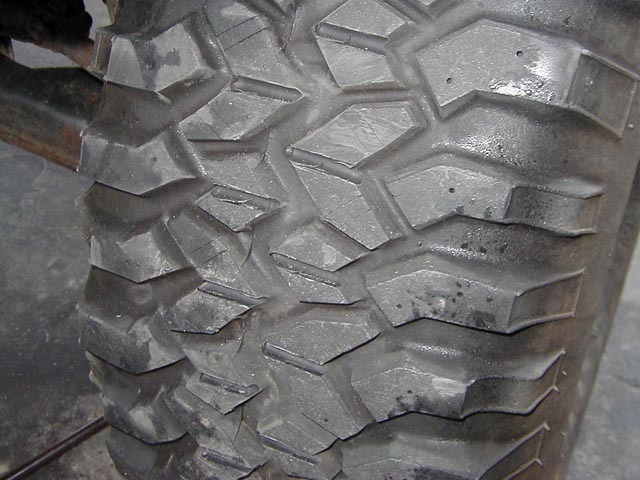 While cutting tires is becoming more common, there are no patterns or guidelines for grooving off road tires, so I decided to limit the grooves to the center tread blocks until I had sufficient time to determine whether or not they chunked and what effect this would have on my daily driver. I cut each center lug straight across the middle, in an effort to mitigate chunking - similar to making sipes and staying away from the leading or trailing edges of the lugs. My knife came equipped with a #5 head which provided a 0.250" cut width. Push the knife across the tread blocks rather quickly. The cuts are over half way through the lugs, but not close to the carcass. Scraps from just one tire. 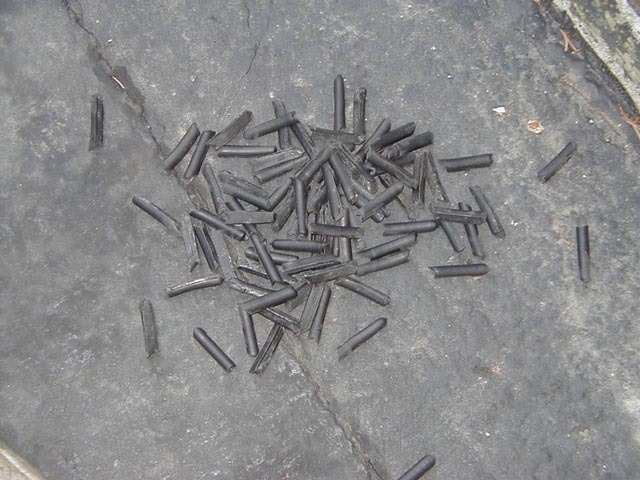 Burnt tire rubber is very unpleasant. The cutting is not difficult. With some quality work gloves on, firmly grab the knife and lay the cutting head flat on the lug and push the knife across the lug. I found that a fairly rapid pace provided the cleanest groove, and cutting the cold tires required minimal effort. 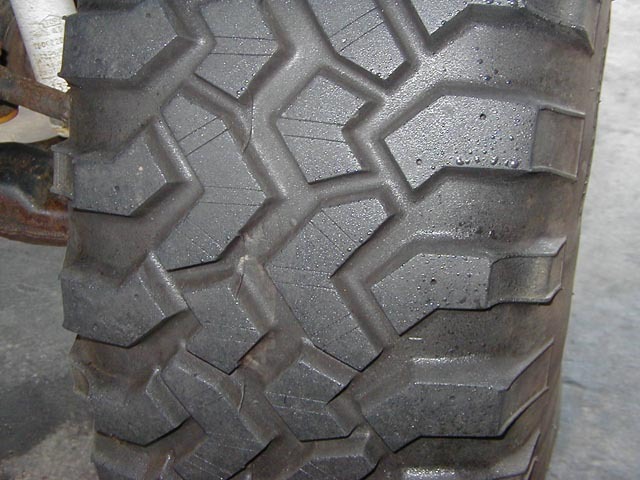 The "new and improved" tread pattern prior to driving on the tires. 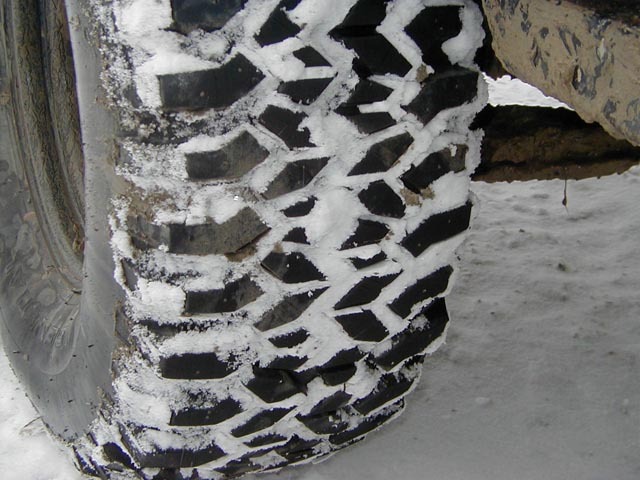 Ice and snow traction are amazing, and the tires grab much better on the trail. The results of cutting the tires exceeded my expectations offroad and onroad! On the surface, a modification like this may be appalling to someone who wants to keep civil road manners on a daily driver / weekend wheeler, but I found road noise diminished and traction noticeably improved. In numerous hard and panic stops onroad in snow, ice, and wet pavement, the tires provided very confident and controlled stops, due to the increased number of tread lugs and the pliability of the lugs. The effect of grooving the tires was profound on the trails. The first time out, we hit trails covered in snow and ice, and the tires literally clawed at and climbed over everything. Making ascents up hills over ice-covered rocks was sure-footed, with wheelspin minimized. The additional breaks in the lugs also helped the tires self-clean in the mud. While I had been satisfied with the tires prior to grooving them, I was completely impressed with them afterwards, and will consider additional grooving as they wear down. Approaching 2,000 miles of use on the tires since the grooving, I have yet to notice any detrimental effects. The tires have not chunked, noise remains low, and traction greatly improved in all conditions (especially aired way down offroad!). A modification such as this will almost assuredly void any warranty on the tire, but if that is of no concern (or if the warranty is expired on a worn-down tire), grooving is a great way to get "more".